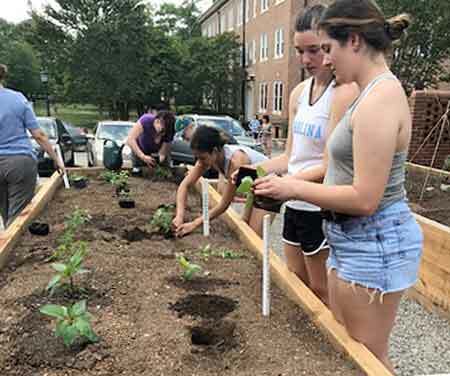 Just steps from the heart of the UNC-Chapel Hill campus, students and community volunteers recently planted a new Edible Campus hub garden. On Earth Day, April 22, 2017, Chancellor Carol Folt joined the North Carolina Botanical Garden, Edible Campus student coordinator Laura Mindlin and the students and volunteers for the planting. Chancellor Folt helped plant a fig tree as part of the event. Edible Campus is a student-initiated project that promotes edible landscaping at Carolina, allowing the campus community to harvest fresh fruits and vegetables from edible gardens throughout campus. The hub garden is located behind Davis Library, but Edible Campus also sponsors numerous edible plantings across campus. The Edible Campus will celebrate its first harvest this fall. That same day, Provost Jim Dean joined volunteers, staff and supporters of the nearby Carolina Campus Community Garden in the opening of the garden’s new greenhouse, a fully solar-powered structure that will support the garden’s efforts to provide free, fresh fruits and vegetables to UNC’s lower-wage workers year-round. The greenhouse will also support a greater quantity and variety of produce, including indigenous vegetables from these workers’ homelands, and will make it possible to distribute seedlings to workers, so they can grow gardens of their own.